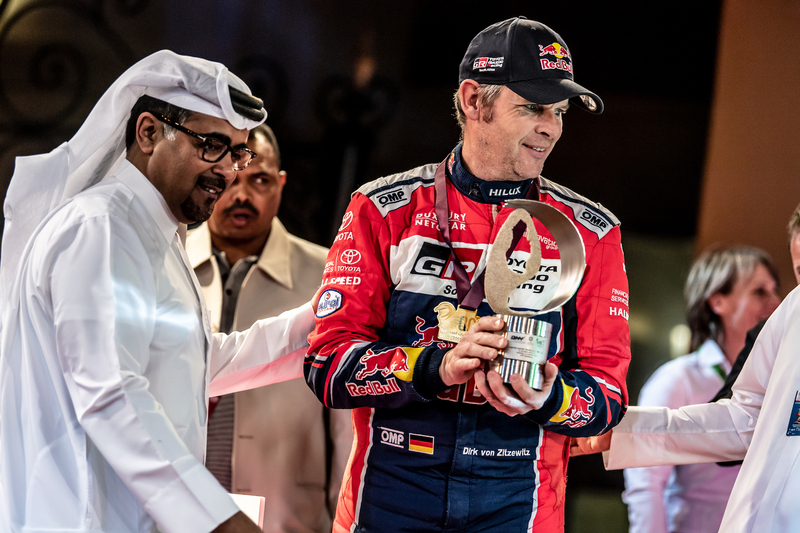 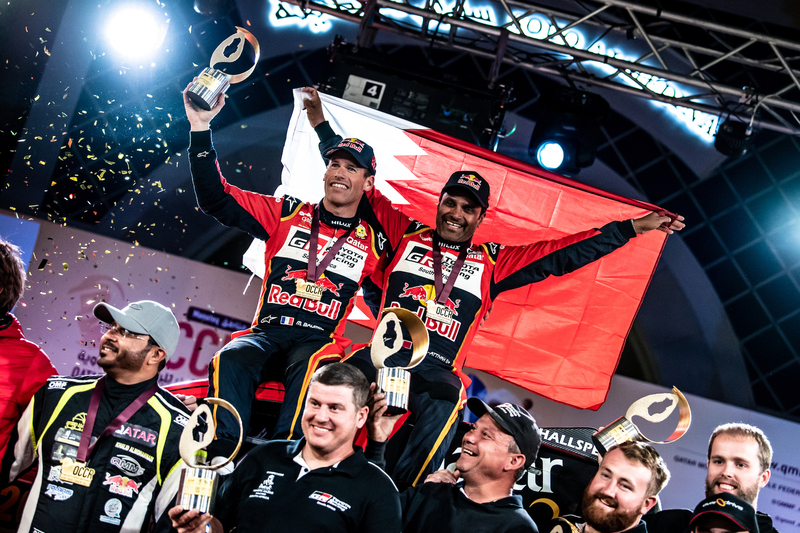 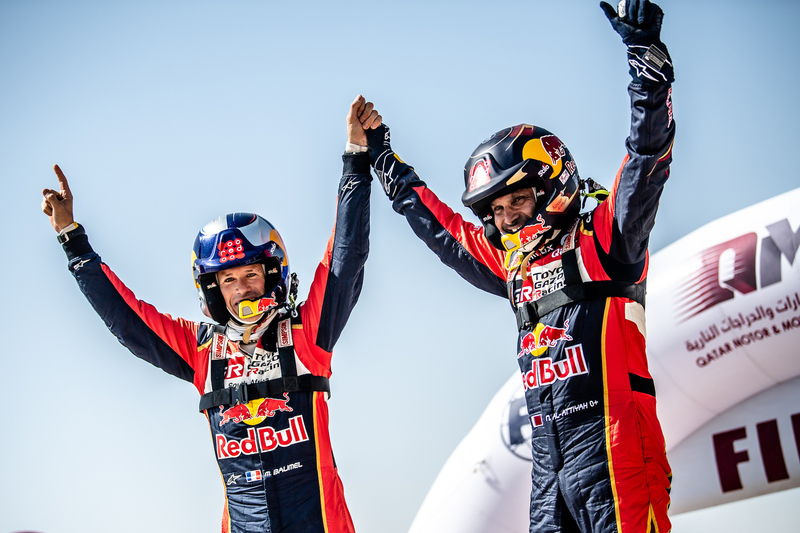 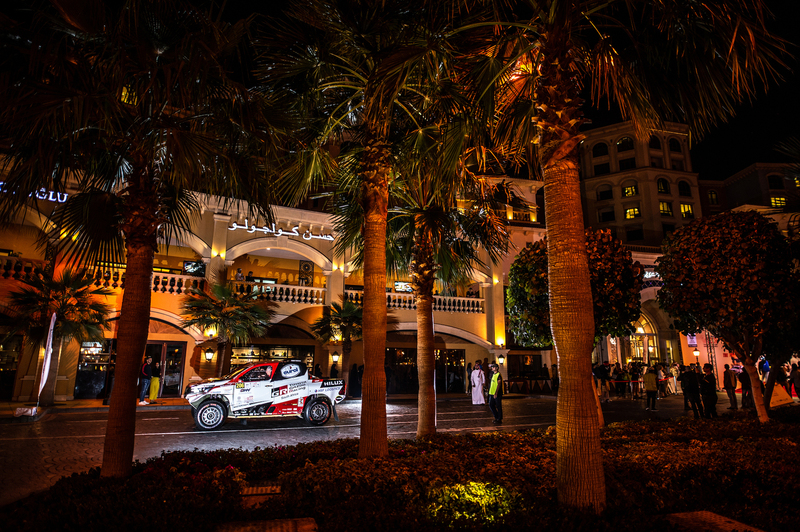 LUSAIL (QATAR) – Tuesday, February 26: Qatar’s Nasser Saleh Al-Attiyah and his French navigator Matthieu Baumel confirmed a start-to-finish victory in the Manateq Qatar Cross-Country Rally, the opening round of the 2019 FIA World Cup for Cross-Country Rallies, at Lusail on Tuesday. 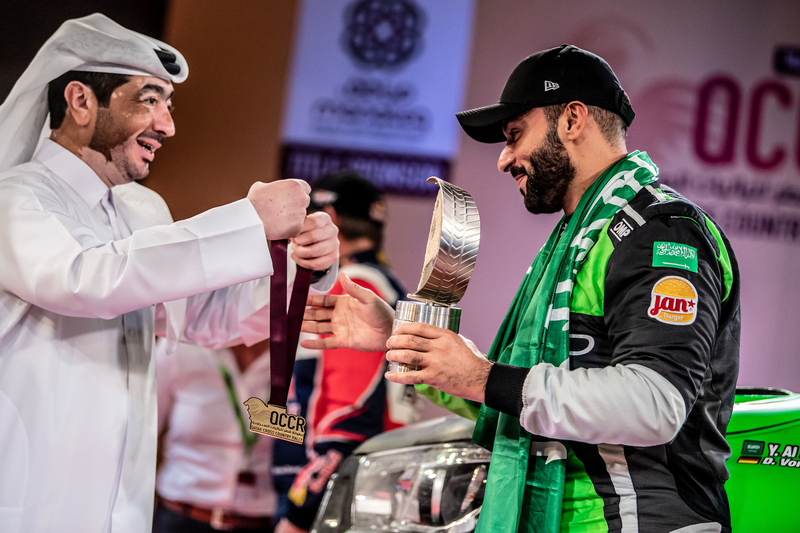 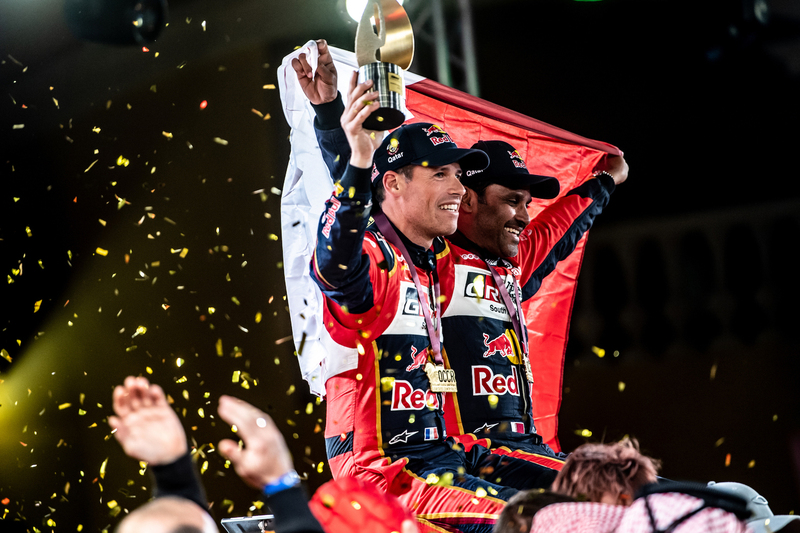 A sixth win for the Qatari and a fifth for the Frenchman since the event joined the FIA series in 2012 (Al-Attiyah won the 2011 Qatar International Baja as well) also marked a fourth for Overdrive Racing and Toyota. 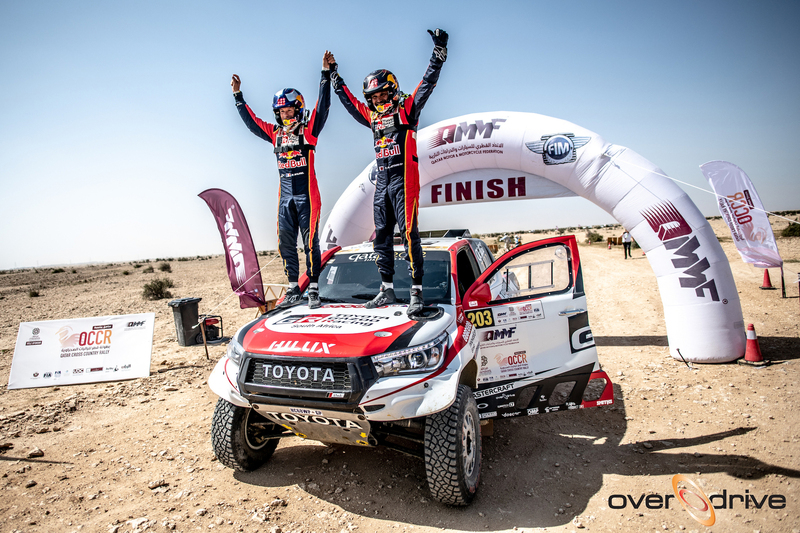 Al-Attiyah’s winning margin was 11min 10sec over Overdrive team-mates Yazeed Al-Rajhi and Dirk von Zitzewitz in a second Toyota Hilux. 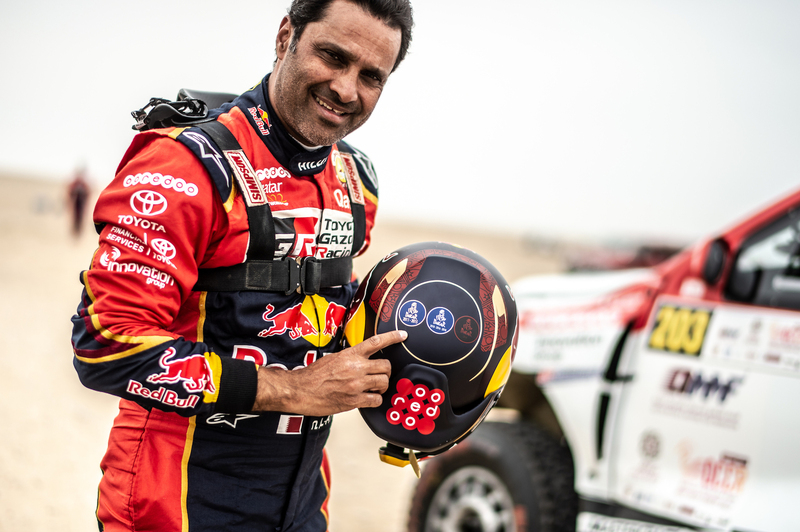 Baumel added: “It’s never easy in Qatar, but one of the big differences is Nasser’s experience and knowledge here. 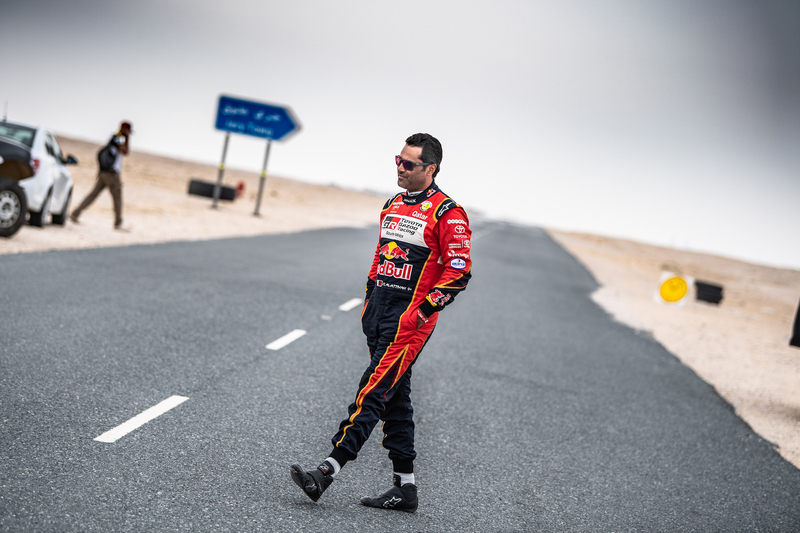 He knows very quickly to choose the direction from what I am saying. 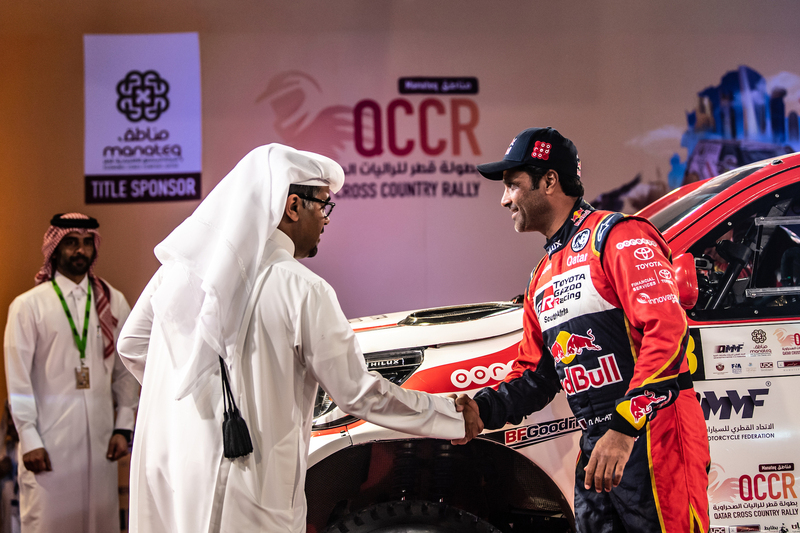 It’s a very satisfying win, especially for Nasser, Qatar and the start of our championship. 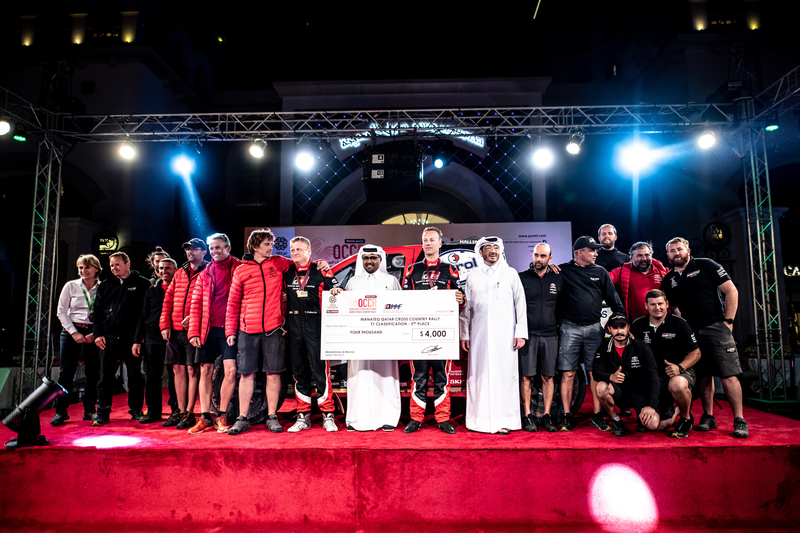 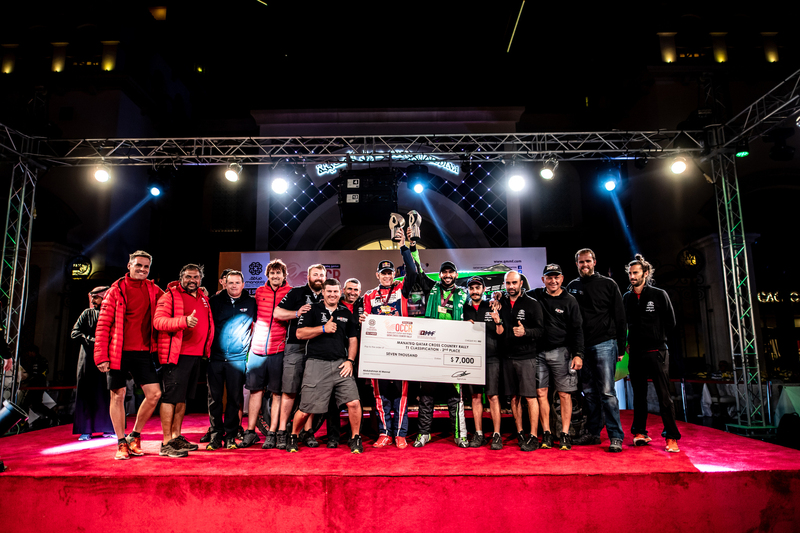 Al-Rajhi came under severe pressure from the defending FIA World Cup champion Jakub ‘Kuba’ Przygonski over the closing kilometres and held on to second place by the margin of just 46 seconds after over 13 hours of racing. 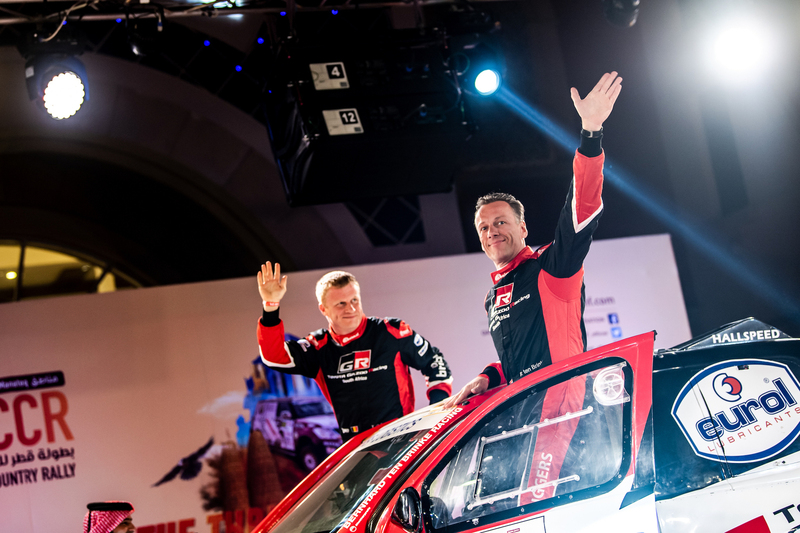 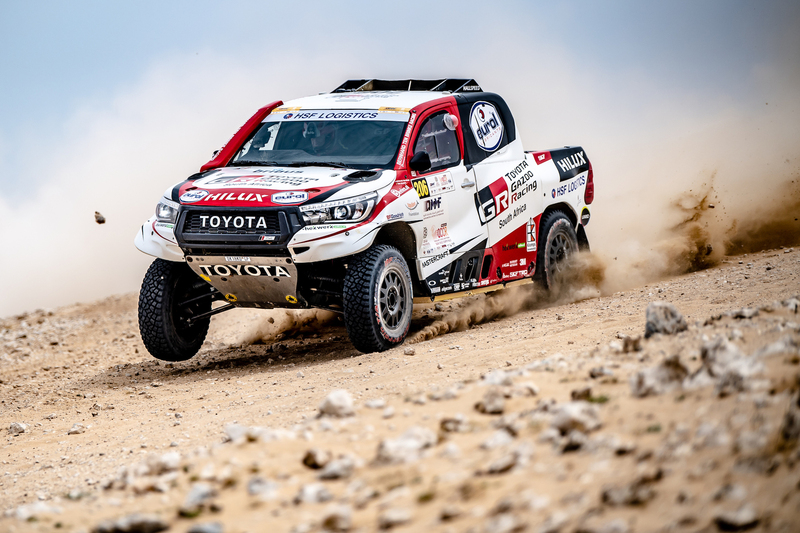 Dutchman Bernhard Ten Brinke and Belgian co-driver Tom Colsoul lost time early in the event with navigational issues, but bounced back strongly from 11th place to reach the finish in sixth overall in the third Toyota. 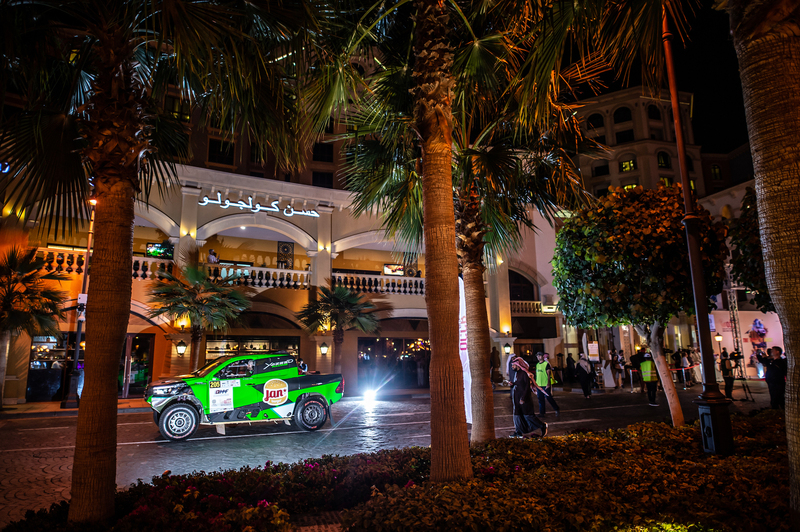 Jean-Marc Fortin, CEO of Overdrive Racing, said: “It is a great start to the season and a fantastic way to follow Dakar. 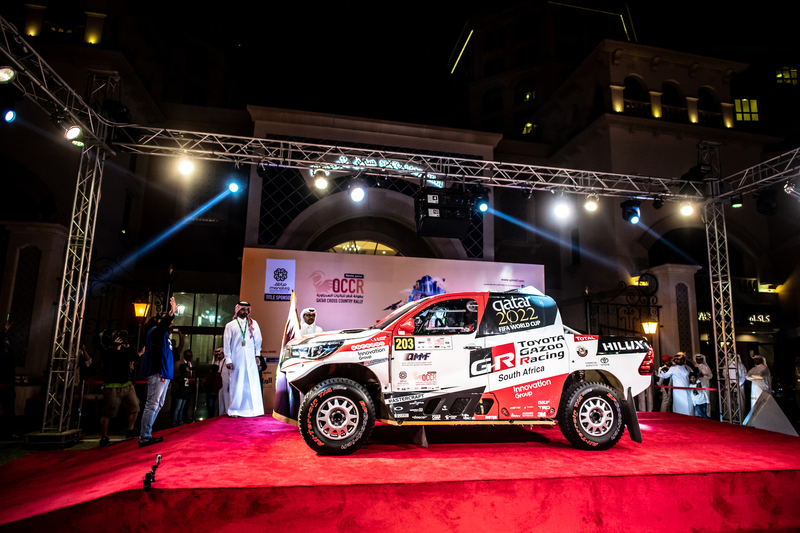 Nasser was the fastest on the stages. 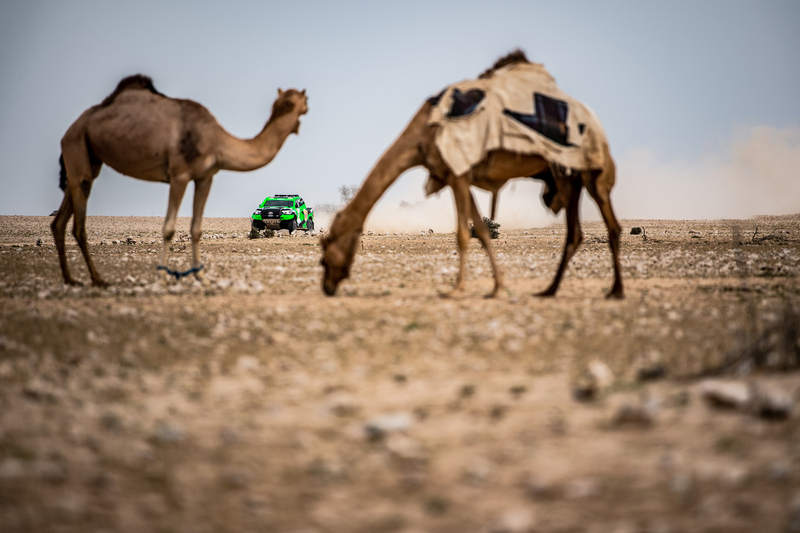 We came for it, that is for sure. 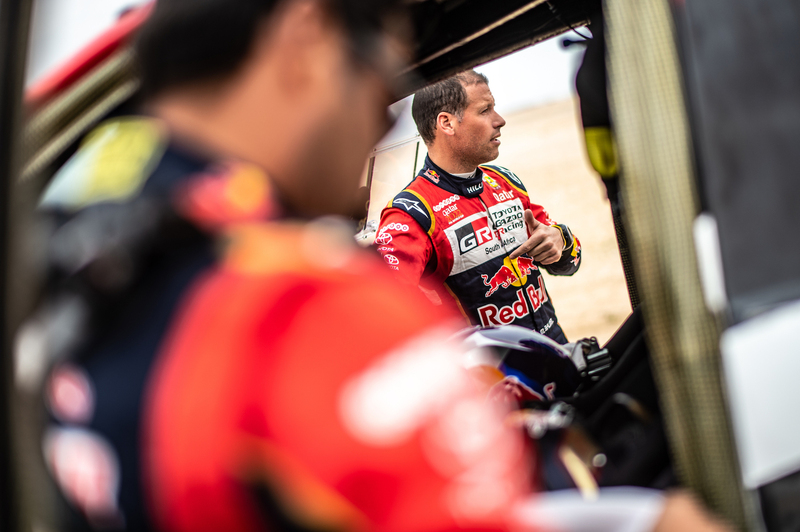 It’s great for the team, because we didn’t get much of a break before the race after Dakar. 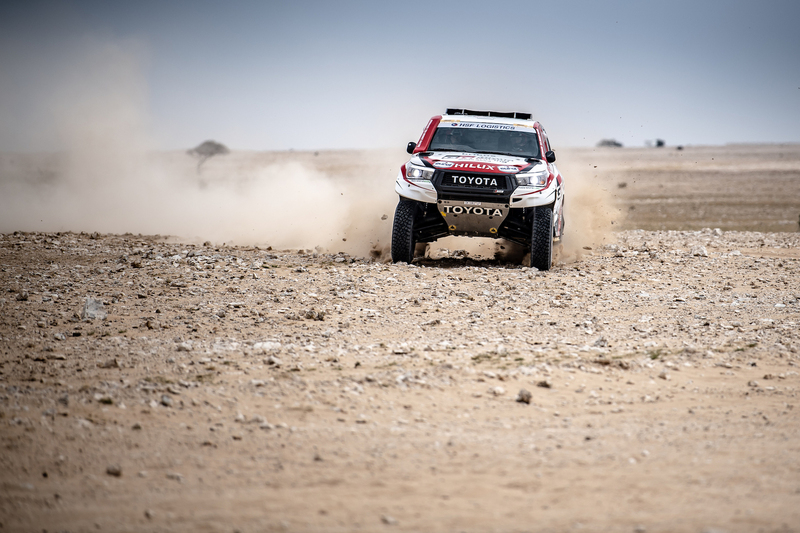 The Toyota trio made the perfect start and Al-Attiyah managed to overtake stage opener Jakub Przygonski near the finish of SS1 and edge into a 3min 05sec advantage over his Dutch team-mate Ten Brinke. 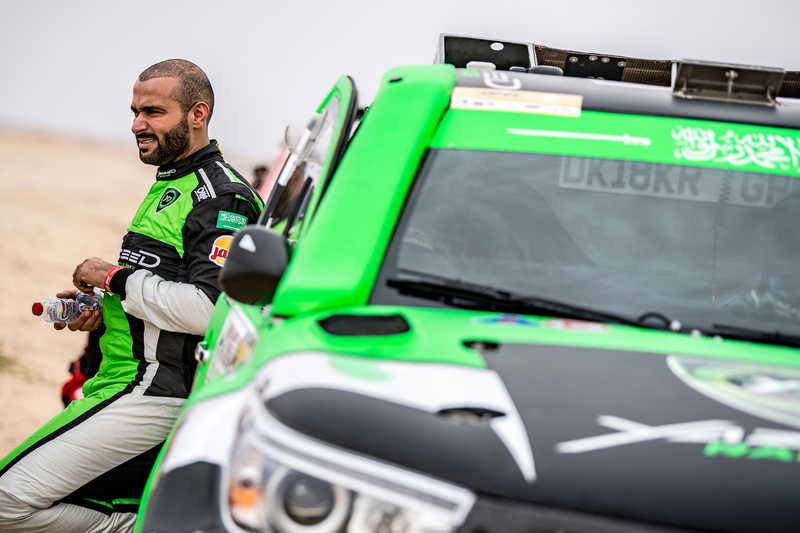 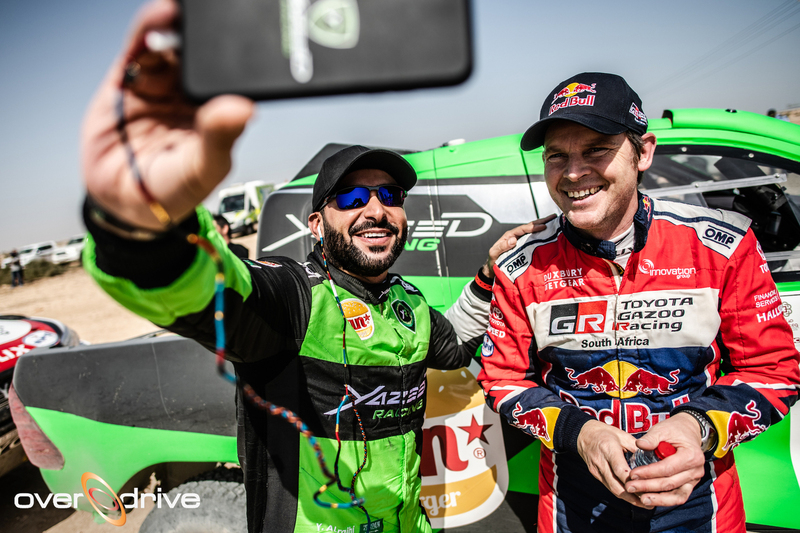 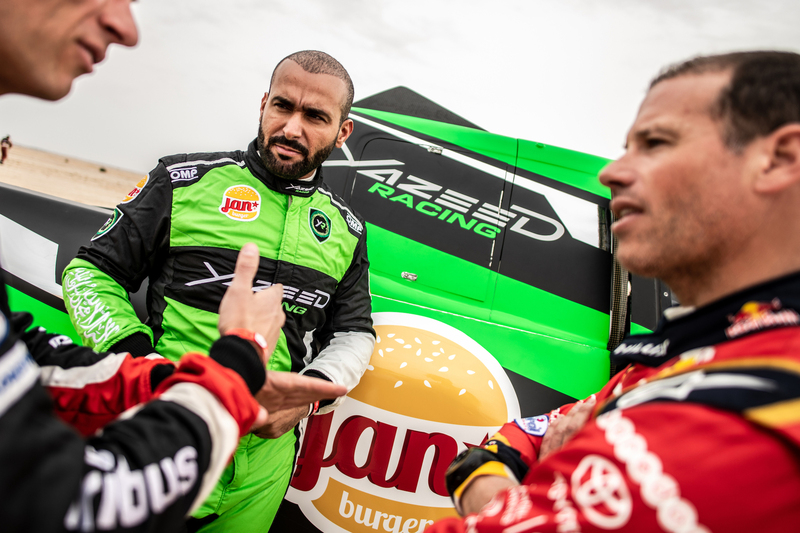 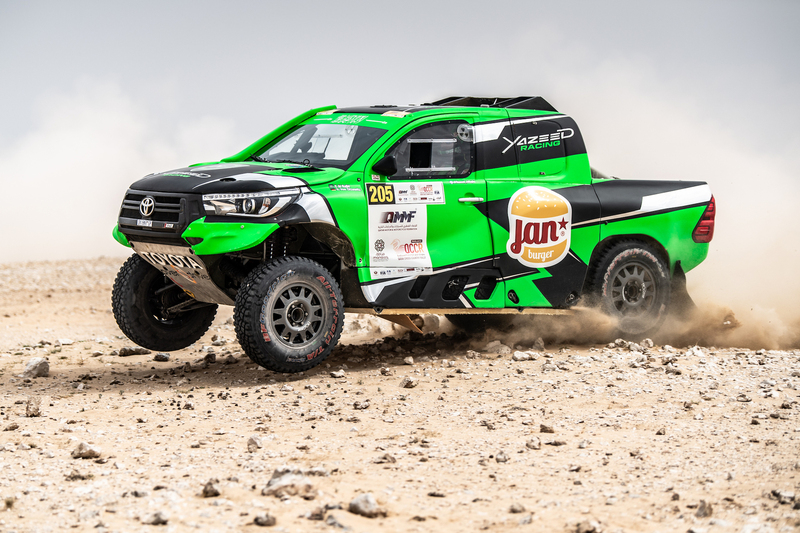 Al-Rajhi was content to acclimatise to the new car and working with his new navigator and the pair were third, the position enabling the Saudi to follow his two team-mates into the longer second selective section of 323.58km. 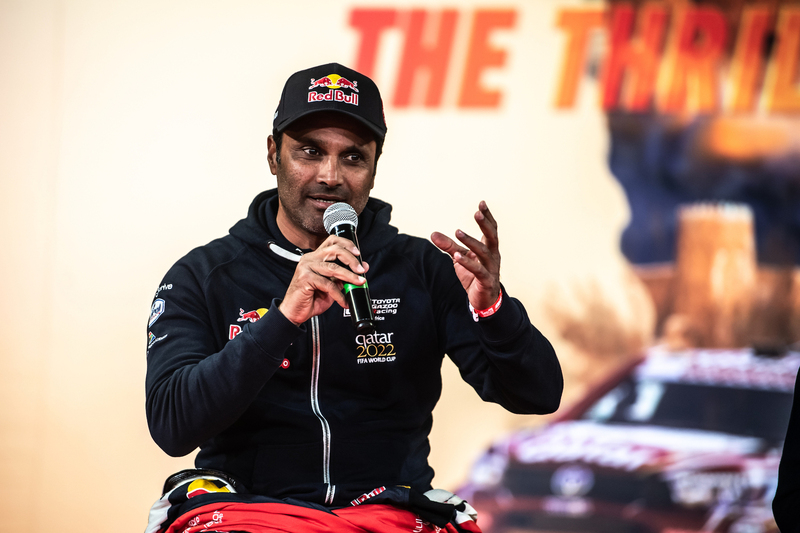 Al-Attiyah led from the front through the second stage and overcame an early flat tyre and the demanding navigation to claim a second successive stage win and extend his lead over second-placed Jakub Przygonski to 8min 03sec. 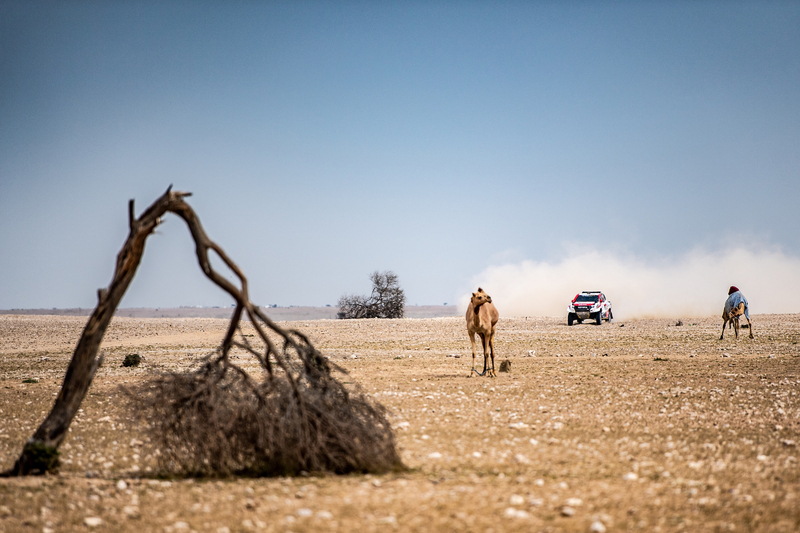 Al-Rajhi and Ten Brinke also suffered from flat tyres: the Saudi retained third overall, despite two punctures, but the Dutchman endured three punctures and was badly delayed with a broken steering arm. 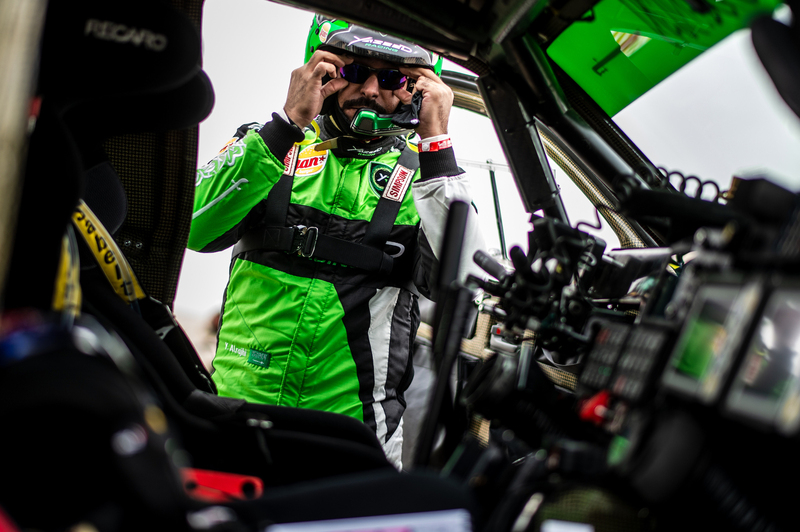 He eventually lost over two hours and slipped to 11thoverall. 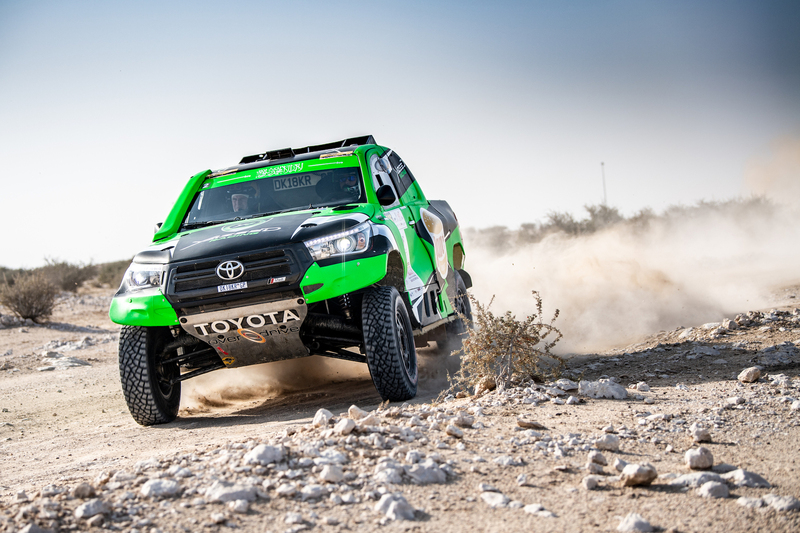 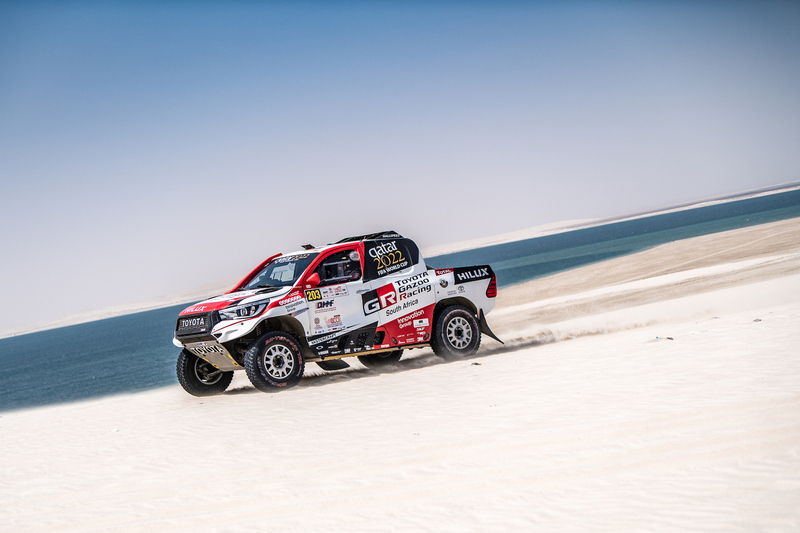 The third stage was the longest of the entire event with 351.98km of competition and included the first series of dunes close to the Inland Sea, south of Doha. 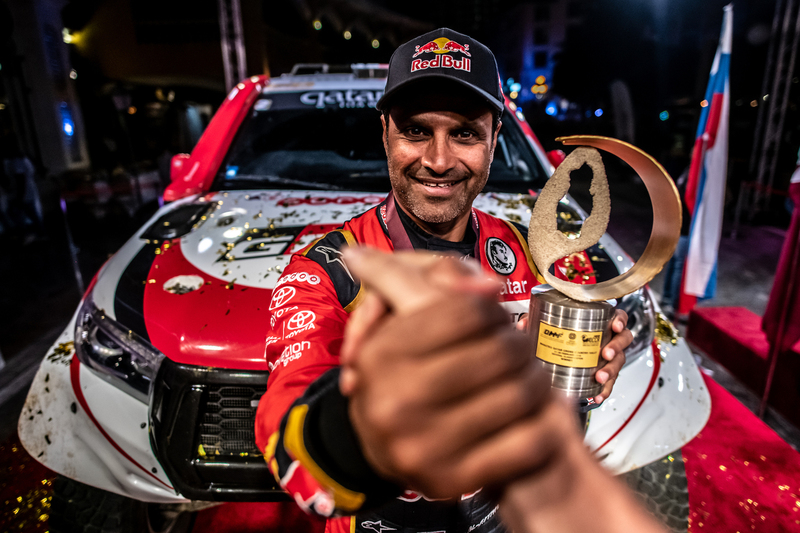 Al-Attiyah survived one delaminated tyre and avoided any navigational mistakes to claim a third successive fastest time and extended his outright lead to 9min 52sec. 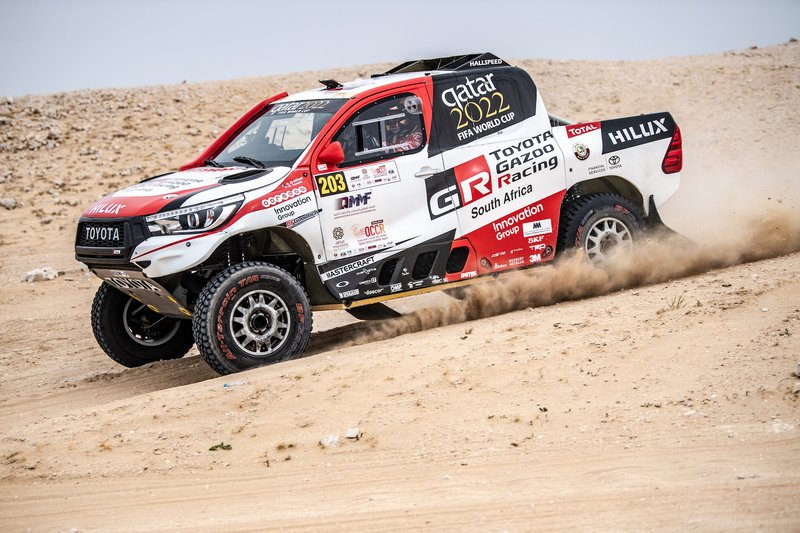 Al-Rajhi passed rival Przygonski to claim the second fastest time and give Toyota a 1-2 at the top of the leader board. 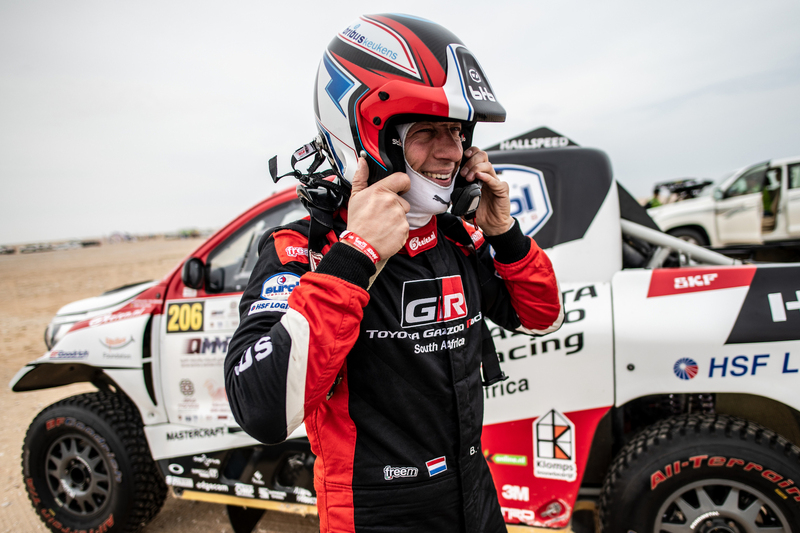 Ten Brinke suffered navigational delays, but climbed from 11th to seventh as many of his rivals hit trouble. 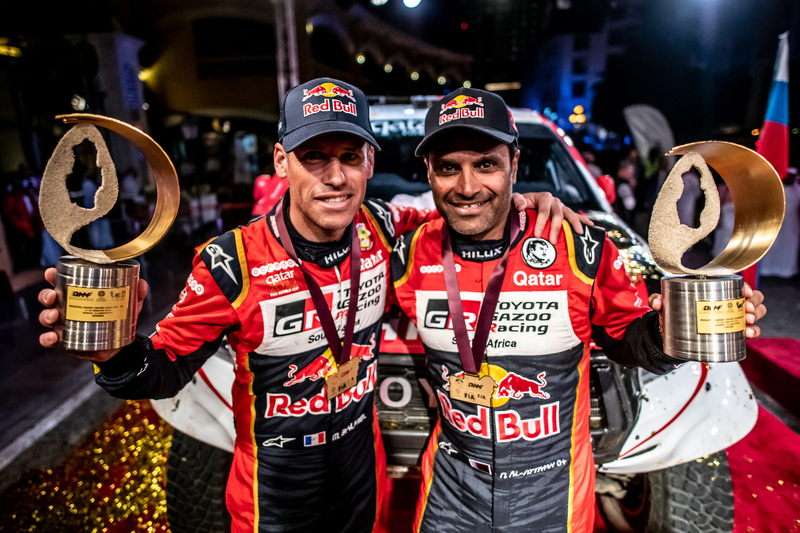 Al-Attiyah and Al-Rajhi shared a stage win apiece on leg four, with the Qatari finishing the day with a comfortable lead of 12min 33sec and the Saudi rueing three flat tyres that cost him valuable time on the first one. 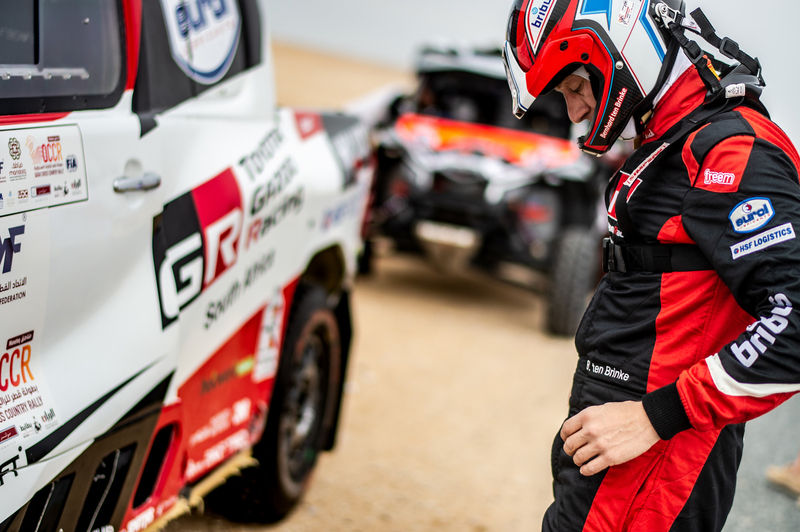 Ten Brinke was back in the zone and was second and fourth on the two specials and climbed to sixth in the rankings. 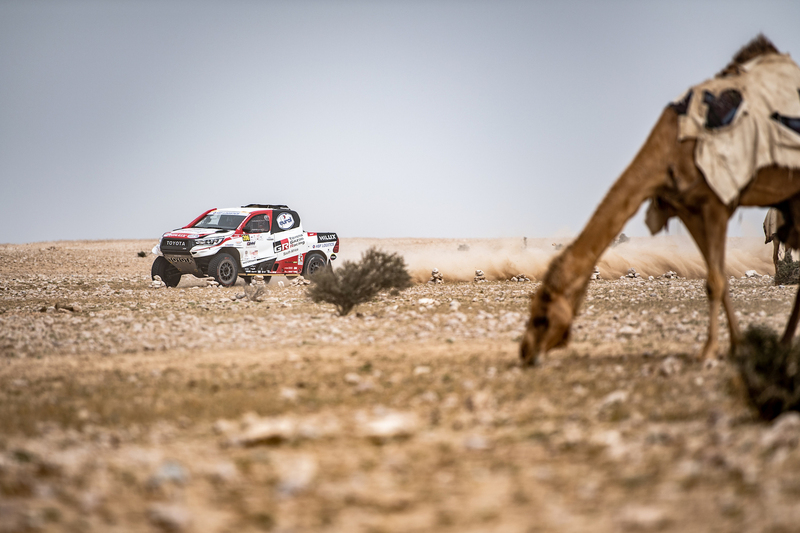 The final stage ran from the western coast, across the north of the country and back down the eastern shoreline to finish north of Al-Ghuwayriyah. 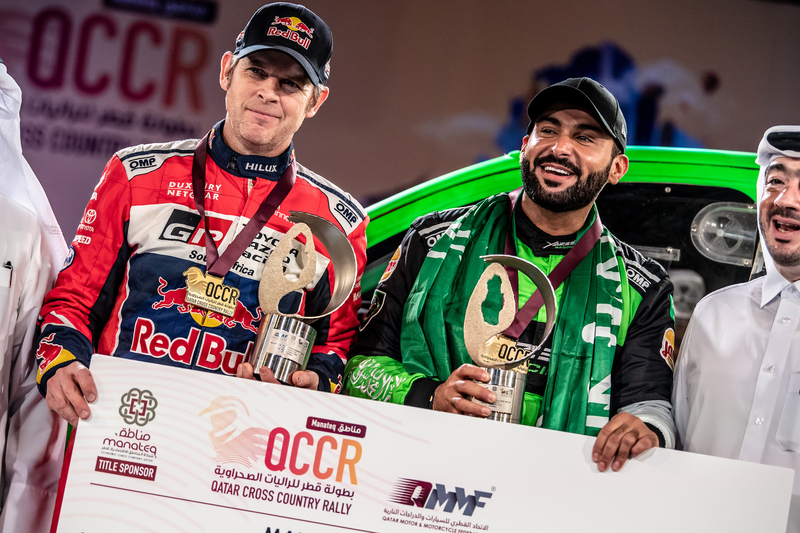 Al-Rajhi was on the defensive and the second fastest time enabled the Saudi to retain second position, as Al-Attiyah coasted to the win and Ten Brinke conserved sixth place.